HighLow reviews & complaints by real traders 2018! Broker exposed! 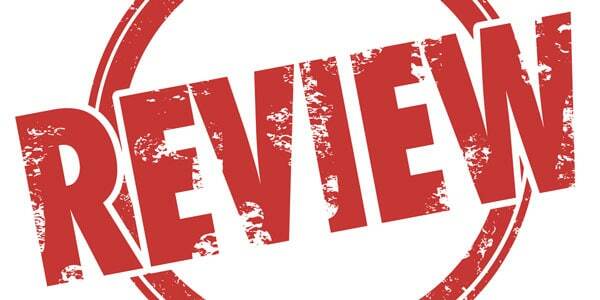 It is a broker that many claim that it is the best out there.That is why I made this HighLow review. I searched the internet a lot. And I know how to search.I am searching on the internet before Google. Still, I couldn’t find any serious real trader’s HighLow complaints. There are some complaints by frustrated traders that lost their money. But mostly are these comments that you make when you are angry and you want someone to blame for your loss. We all know how it feels to lose. This does not mean it is the brokers fault. Note:this is a review. Click here if you want to visit the official HighLow website. This doesn’t mean this is the perfect binary options broker. Maybe their platform never freezes during a trade. They do not use “managers” that call you all the time to deposit money. No shady bonus tactics. Still, it has its drawbacks. If I find HighLow complaints in the future I will add them here. For now, we will continue with the HighLow review. With more than 4 years on the binary options scene, HighLow is a well established binary options website. There is no software to download. It’s completely web-based supporting several browsers. You just visit HighLow login page. It is also mobile capable. Traders can trade via mobile devices with HighLow. The trading platform of HighLow.net is translated in Chinese & Japanese language. HighLow is one of the few that offer binary trading in Japanese. While trading with this friendly broker, traders do not need to worry. 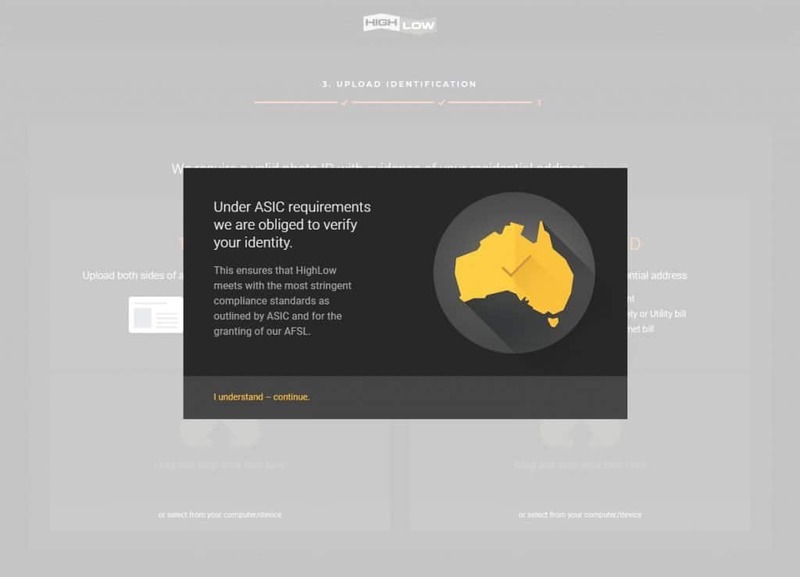 This broker is regulated with AFSL ( Australian Financial Services Licence) by ASIC (Australian Securities and Investments Commission) under license no. 364264. As I say in my Marketsworld review , ASIC regulation is a bit better than Cysec (Cyprus commission) regulation. Being regulated by Australian commission does not mean that if you are a European or African or Asian you cannot trade. (Check below countries accepted) . You can still trade wherever you are. It is just based in Australia, so it is regulated by Australian authorities. Which is far better than a Cayman Islands or any other offshore “regulation”. Of course, there are some countries that are not accepted by the broker itself. Us residents, for example, are not accepted. HighLow broker offers a friendly trading platform and a secure trading environment. 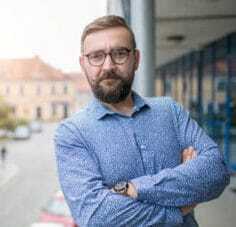 This way, investors get confident in dealing with this binary options broker. HighLow does not use Client Money for hedging purposes. Clients Money are segregated from those of Highlow Markets Pty Ltd (HighLow) and all money is held on behalf of clients in Client Money Trust Accounts with National Australia Bank (NAB), a regulated Australian bank. Unlike the majority of the online binary trading brokers, HighLow 2017 offers an own made web-based platform. The interface is well designed and made it as flexible as possible for traders. There are no complaints about the platform. The platform provides a combination of effective trading tools and intuitive functionality. Each contract is highlighted and a click away from you. The same applies to the various option types available in the system. They’re so simple to use that even newbie can immediately begin trading through them. 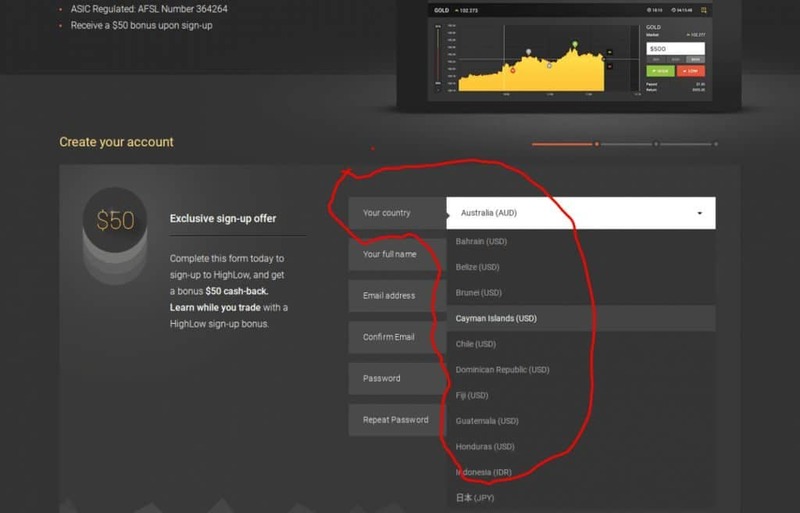 HighLow is offering its traders to trade with different types of options. These include HighLow, HighLow Spread, Turbo, and Turbo Spread. With a Minimum trade amount of $10 only, a trader can trade with different assets that include 17 Currency Pairs and 7 indices. 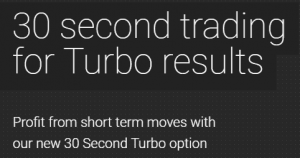 About the Expiry Times, this broker is currently offering 15 minutes, 1 hour, and 1 day Expire times for its traders.With the “turbo” feature you get 30sec,1min, 3min, and 5min. This type of option shows a bid/ask spread, the standard method of price making in the forex markets. Spread HighLow offers payouts of 200%, that is double your investment. This option type suits the investor who expects large market movements and prefers the higher payout. 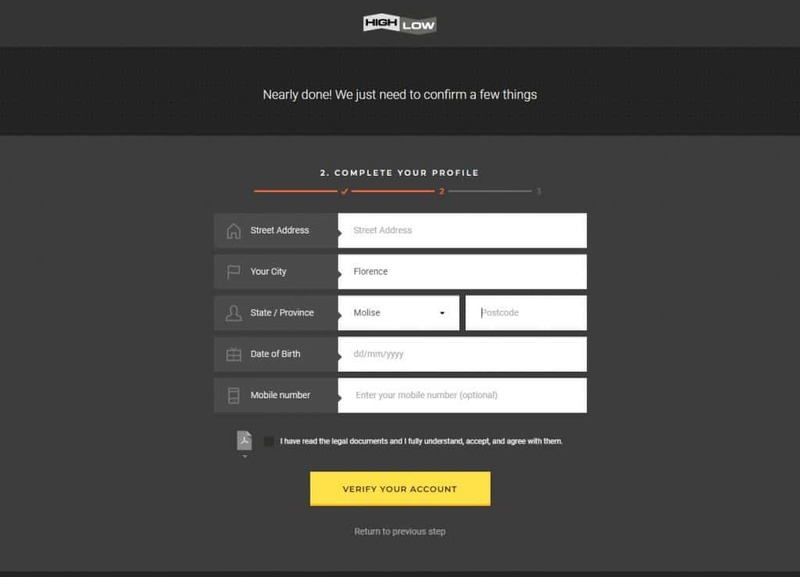 Let’s get on with our Highlow broker review. The most important is that you will not find easily withdrawal complaints around the web. All winners get their money. For all brokers I found complaints about withdrawal problems. Even for those companies that are very reliable and they definitely give the money to the winners. But Highlow has the fewest complaints of all. And this is because of the Australian rules I wrote above. They cannot use your money. While other brokers may delay your withdrawal because they use your money for investments. Funding your trading account with HighLow binary options broker is so flexible and hassle-free. The minimum deposit amount is $50 only for any deposit methods. This makes HighLow for being among the best binary options brokers with low minimum deposit. You can fund your account using your preferred currency whether it is USD, AUD, EURO or GBP. I also give this broker positive marking here, when the issue is withdrawing your money from your trading account. Withdrawals to your bank account take up to 3 days to reach your bank account. This is the standard for bank transfers. The broker can’t do something to make it faster. Neteller, Credit Cards or other withdrawals are processed instantly. You can easily make the deposit or withdrawal request from your my account Dashboard. Another great feature about this broker is that a trader can easily open a demo account to practice binary options or check out their brokers’ features. With no registration required, you will be eligible to trade on demo with $10,000 of virtual funds. It has a “quick demo” link on the upright corner of their homepage and you can start your demo with just one click! The fastest demo I’ve seen. No email, nothing. Just one click. 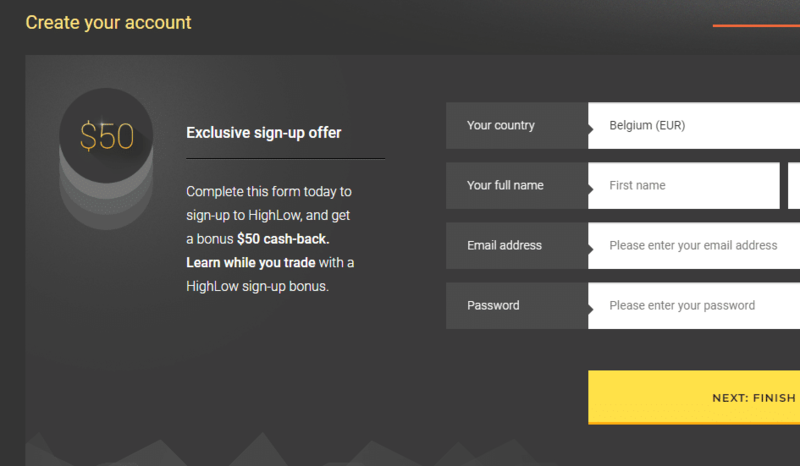 As their business promotion, the HighLow broker is currently offering up to $50 CashBack bonus on trader’s initial trades. It offers other bonuses , as well, that change over time. This broker is currently accepting clients from Australia, Japan, Indonesia, African countries and many more. But unfortunately, this broker isn’t accepting any traders from US, Canada, EU, UK & India to trade on their platform. They have to meet their regulatory criteria. This company also provides its traders’ the facility to trade with their iPhones or Android-enabled mobile devices. Just search Highlow app download. As HighLow trading broker has been around since 2014, reliability is very good. I have not had any problem at all with them on the matter of platform. Never freezes. This is all good features for one or another. 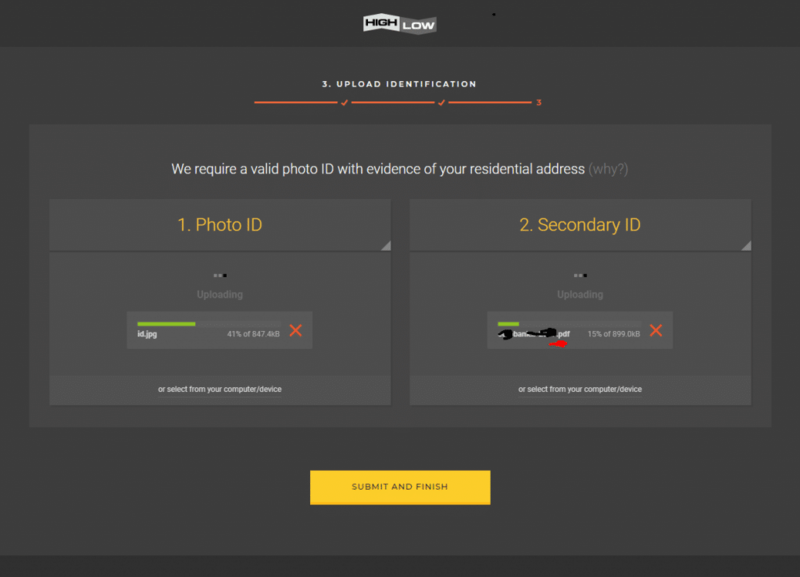 Is HighLow broker a Scam? Well, I must say this broker it definitely doesn’t steal your money. If you search you will find the fewest complaints than any other broker. Not only it is not a scam, but I also think it is the best and most secure binary options broker. Before writing this review, I have personally tested their platform and made some quick profit. I even traded on Friday to check their platform if they do manipulate the price on busy days. As expected, I haven’t noticed any price manipulation. I haven’t checked the bank withdrawal option. Yet, my withdrawal request through Credit Card was processed and I got my profits transferred to my account within 15 minutes. 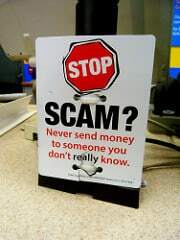 Not only me but almost all the traders that tried it think that they are not a Scam broker. 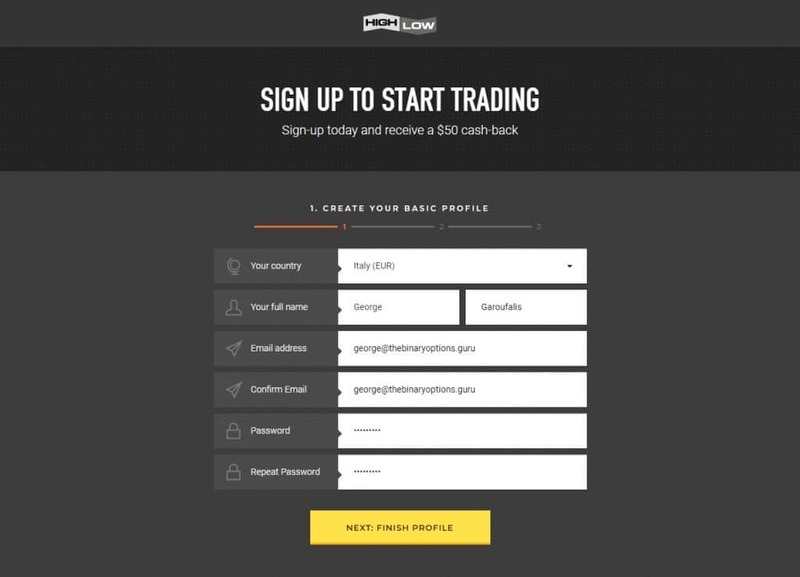 Click here to visit Highlow official and start trading! Is it easy to open an account? Yes it takes 3 minutes. note: do not worry about the documents. The fact that they ask for proof is a good thing. They ask them because the regulator asks them to do so (Australian authority in this case). They follow the rules. And when there are rules it is a good thing. They do not cheat. They check the documents really fast and you are ready to trade! In the last, I am extremely satisfied with HighLow broker. I would love to trade with them myself. I score them 9.6/10 for their services. It is a very reliable binary options broker. Your money are safe with them. Really good platform. In my opinion, it is the best binary broker out there. And I have tried them all. If you have any experience or suggestion, please leave your review below. This was my HighLow review and the complaints about this binary options broker. For a complete list of best binary options brokers available so far, click here. Please leave your review above or just a comment below to help other traders! I liked the Expertoption trading. To work these conditions is enough with your head, and with the right approach, the profit can be really good. can’t find nigeria in the drop down section of country. Which reliable broker can I use ? You can use Expertoption, Ayrex or IQoption. But be careful. Binary optioins are not so easy as it may seems. Most people lose their money. Trade only the money you do not need. Ok thanks for Ur prompt reply. I think I would like to consider expertoption and ayrex. The reviews about IQoptions is not very positive. Hope the reviews about expertoption and ayrex are better than IQoptions. Please I am looking for a broker like Binary cent, but a really good one, that has high payout percentages, with minutes binary options trading. 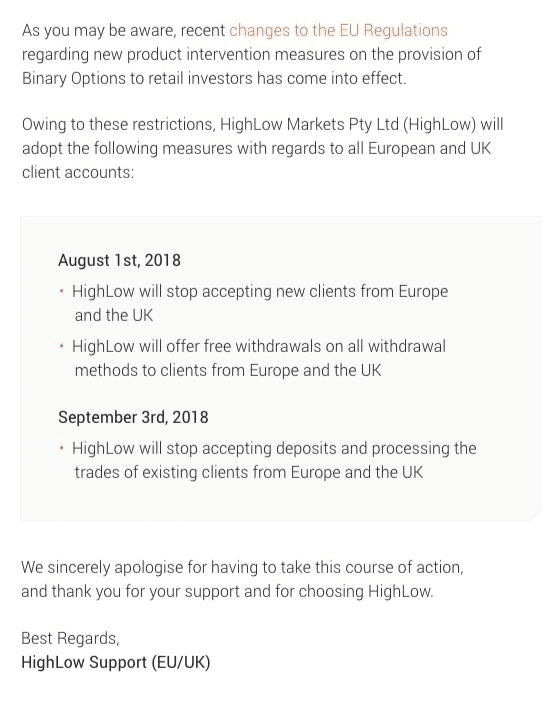 In reply to a fellow trader: Yes, European traders can trade with HighLow after the 2nd of July! IQoption and other Europe based brokers will accept European traders only if they are professional traders. I was told not to trade 60 sec on Highlow, so maybe it is true that 60 sec does not work so good here. I do not like Binary.com for the same reason, ties go to the broker. This becomes less of an issue at 5 mins. I would take your 60 sec strategy and use it on the 3 or 5 min. demo first – slower but more accurate in my case. I wish HighLow will avail more major assets for trading. Hi can you more explain about HighLow Trading platform? in high low you will lose if price not change. its all true about highlow. unfortunately highlow make a mistake to change them rules. highlow was the best but today Not.